I was looking for a browser and a pop-up offering me to install a Torch browser came up. I agreed with its installation but now I think that I want to go back to Yahoo. How can I uninstall Torch Browser on Mac OS X? I have always been using Windows, so I don’t know how to uninstall programs on this OS. Thanks! You may have installed Torch Browser on Mac OS X thinking that it will help you to improve your browsing on the Internet. However, if you haven’t been using it for a while, you should think about uninstalling this program and its components because that’s how people waste the space of their Macs. When system is packed with lots of junk files, it may start causing slow downs and similar issues. So, there is no doubt that you should think about uninstalling Torch Browser on Mac OS X if you don’t use it for your searches. However, we must warn you that you may run into several issues when trying to do that. That’s why we decided to create this article. It was written to help you know about possible methods that can be used for this process. In addition, we will try to explain what is needed after selecting each of them. If you want to uninstall Torch Browser on Mac OS X successfully, you can choose from two options – uninstalling and removal. While both of these options may seem to you very similar, there are more differences than similarities between them. That’s because manual removal gives you no guarantee that the additional files of the application that you want to uninstall will be eliminated. Fortunately, this can be achieved by selecting uninstalling of Torch Browser on Mac OS X. Please, note that this option requires installing a free tool, which is called MacKeeper. After doing so, you will be capable of finding all leftover files of this application and other programs. 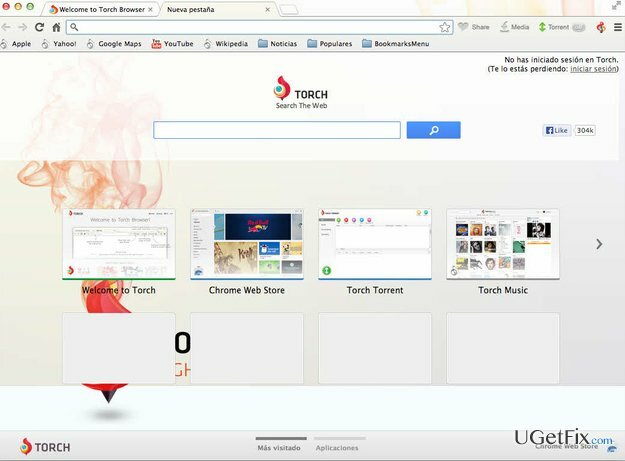 Find Torch Browser icon, then click and hold it. Put the Torch Browser to Trash. Empty the Trash by holding Ctrl and clicking on Empty Trash. However, after you drag the icon of this application to Trash and erase the app, you should also try to find all associated files of it. They can be hidden in any folder, so you should try to run thru all of them and make sure that all Torch Browser’s files are gone. That’s how you will get ability to avoid system slow downs and other troubles that are usually initiated by programs’ leftovers. Please, dedicate some time to check these and other folders on your Mac for a successful uninstalling of Torch Browser. Beware that this process may require some time, so if you don’t have lots of patience, you should use MacKeeper and uninstall Torch Browser on Mac OS X with almost one click. Reimage Reimage is recommended software to uninstall Torch Browser.